Originally from the Hunan province in China, Jing Zeng came to UNE on an exchange programme through Shaanxi Normal University in 2014. A postgraduate student at the time, Jing was studying to become a teacher of English to speakers of other languages (TESOL). UNE offers a range of high-quality degree programs for both undergraduate and postgraduate International Students seeking to study on campus in Armidale. Many are welcomed to UNE as an Exchange Student (as in the case of Jing) or in the Study Abroad program. During Jing’s time at UNE she stayed at Wright College in a six-bedroom flat, where she made some great friends. 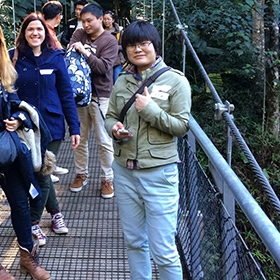 When recollecting on her UNE experience, Jing looks back fondly on the short trips organised by the university to different areas in the region and throughout NSW. She also has a special memory of the International Leaving Ceremony that is organised for all exchange and visiting students studying at UNE prior to their return to their home countries. Her studies at UNE saw her completing work across 3 units including English Grammar and English Language. As for most university students, Jing had her own challenges she faced while here. Jing has since graduated from her degree (2015) and is now an English teacher in China. She loves reading books and spending time developing new skills. Jing still feels a strong connection to UNE and it’s clear it impacted not only her career but her personal life as well.